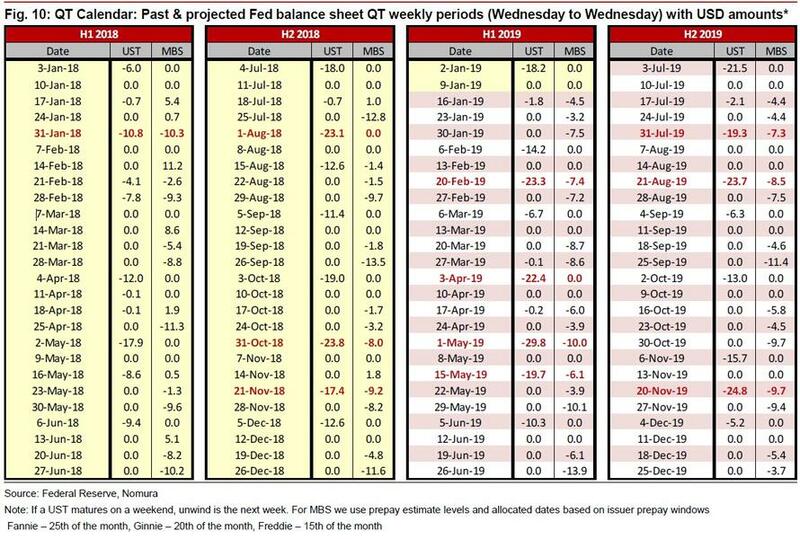 It is therefore hardly a coincidence that just over a week ago, JPMorgan's head quant Marko Kolanovic said that there is one chart that "traders tape to their screens, blogs and email chains", namely the complete QT calendar consisting of past and projected Fed Balance sheet QT weekly periods, such as the one shown below courtesy of Nomura's George Goncalves. 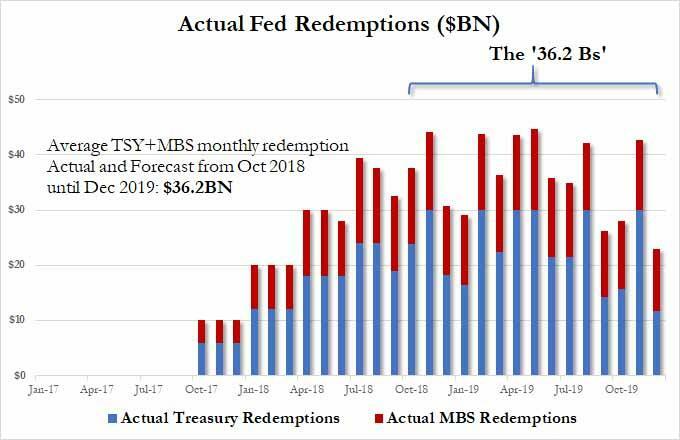 The reason why this schedule matters, is because - whether due to a self-fulfilling prophecy or some other liquidity soaking market dynamic - on days when the Fed's balance sheet shrinks whether due to Treasury or MBS maturity, think of it as a reverse POMO, risk assets are hit. Adding fuel to the dovish fire was a Friday article in the WSJ which said the Fed is considering a quicker end to its balance sheet runoff which has caused so much market anxiety and volatility. According to the WSJ, Fed officials "are close to deciding they will maintain a larger portfolio of Treasury securities than they’d expected when they began shrinking those holdings two years ago, putting an end to the central bank’s portfolio wind-down closer into sight." The article also added that "officials are still resolving details of their strategy and how to communicate it to the public" however, "with interest rate increases on hold for now, planning for the bond portfolio could take center stage." So with so much of the market attention once again falling on the the Fed's balance sheet especially in the aftermath Powell's recent dovish U-turn, there is a palpable expectation that tomorrow the Fed will announce it is nearing a decision on when to end the reduction of balance-sheet holdings, essentially a pause in the quantitative tightening cycle. However, as Bloomberg's Vincent Cignarella warns, the difference in what the Fed says and what the markets hear may once again be on display during Wednesday's press conference. Indeed, the Fed has previously said the fed funds rate is the central bank’s primary monetary policy tool, not the balance sheet. As such, if the Fed holds to this mantra, investors looking for comments curtailing the balance sheet runoff may be "massively disappointed" according to the Bloomberg macro commentator. He is not alone. In a note released by Bank of America overnight, the bank's strategist expect the Fed to deliver a message of patience on Wednesday, but they are "skeptical it will be as dovish as the market expects." While the bank expects the Fed to remove the perceived calendar guidance of "further gradual increases" and replace it with more data-dependent language during tomorrow's meeting, which will not have an update of the Fed's Summary of Economic Projections (SEP), BofA does not expect Powell to make any formal announcements during his press conference on the balance sheet, "which risks disappointing some market participants." At a minimum, Powell will reiterate his recent comments that the Fed is willing to be flexible with the balance sheet if it was seen as interfering with the normalization process or if economic conditions were to warrant an adjustment. He may also address the technical reasons for adjusting the path of balance-sheet normalization. Powell will have to balance how much additional detail to provide on the balance-sheet framework based on the progress of internal deliberations, however that's as far as he will go, and will stop well short of validating the WSJ story of an imminent halt in QT. So how should markets adjust their expectations? ... which however is a problem as it suggest at least another $1 trillion, or a little under two more years of rolloff. Cessation conditions and thresholds: the two conditions that could cause the balance-sheet unwind to end will be material (1) deterioration in economic conditions and (2) tightening in money or broader financial markets (i.e. the Powell Put). However, the thresholds for these considerations are uncertain. Longer run balance-sheet composition: the Fed has already suggested it prefers a portfolio of mainly Treasury securities (ie, not MBS) but has provided limited guidance on what this composition might look like. BofA expects the Fed will look to reduce the maturity of its Treasury portfolio to be in line with outstanding Treasury debt or to be similar to pre-crisis levels. Either way, the shortening of its UST holding tenor should favor a steeper UST and flatter spread curve all else equal. The other key detail the market is looking for on the Fed's balance sheet is how the FOMC will ultimately transition to stopping the portfolio unwind. Specifically, the market would like to know if the Fed is going to taper its monthly reductions or stop cold turkey, a question that featured prominently in recently declassified deliberations from 2013 FOMC meetings. This question will likely depend on how willing the Fed is to stop the balance sheet early and take potential political criticism for being too accommodative to markets. If the Fed wanted to taper its reductions it would likely consider reducing the caps on its monthly redemption amounts for USTs and MBS or potentially just stop the UST portfolio reduction while allowing ongoing MBS redemptions. The Fed is likely to eventually lean toward this tapering approach since it is likely very uncertain as to the appropriate level of reserves in the banking system. Besides providing details on the end of QT, one other place where the rates market may be disappointed is in just generally dovish the Fed would sound. One look at the latest Fed Funds shows that the rates market is widely expecting the FOMC to keep rates on hold at the January meeting and send dovish signals on both the outlook for rates as well as the balance sheet. However, BofA believes that the "Fed will be challenged to deliver a sufficiently dovish message to the market that risks a flatter curve and lower long-end rates." While it is true that Fed policy maker communications have taken a decidedly dovish shift over the intermeeting period, most commentators doubt the Fed is yet ready to fully abandon its plans for further rate hikes later this year. If the Fed retains a soft hiking bias in the policy statement as discussed above, the market will likely need to assign higher odds to a Fed rate increase later in 1H19 beyond the current 5bp of hikes priced through July. These communications would also likely send long-end nominal and breakeven rates lower due to policy error concerns. Overall, the Fed is likely to retain some optionality to raise rates later in 2019, which risks sounding less dovish vs market expectations. Going back to the balance sheet, BofA also believes that the Fed may disappoint market expectations here too. Based on the bank's reading of the December FOMC meeting minutes, the Fed likely has a number of important decisions it needs to make before it is willing to signal an imminent end of the balance sheet reduction. As such it is unlikely that the Fed is ready to adjust anything in writing around the balance sheet, which suggests no material language changes on the balance sheet in the FOMC statement, implementation note, or policy implementation plans and principles. This will likely disappoint those who interpreted the WSJ article as a signal from the Fed that the end of the balance-sheet unwind is rapidly approaching. As a result, BofA suspects that "risk assets may react negatively to the lack of balance-sheet guidance and contribute to a further flattening of the rates curve." To summarize: the Fed will likely be challenged to deliver a sufficiently dovish message vs market expectations, which risks a sharply negative reaction in stocks, a flatter rates curve and a risk off USD reaction. The above should make intuitive sense: after all, the Fed engages in either dovish jawboning or actual easing only when risk assets are sufficiently depressed to merit it, such as when the S&P was trading just above 2,300 after the "Mnuchin Massacre" last Christmas Eve. Now, with the S&P is 300 points higher, there is no need for any "emergency" intervention by the Fed, either verbal or otherwise. Essentially, for the Fed to "get more dovish" at this point - which also includes potentially conceding on balance sheet tapering - it would require a major downdraft in U.S. economic data or another market volatility spasm—which is NOT something that is going to help the mood. BofA agrees with this, and notes that "a broader decline in risk assets could also cause the Fed to reconsider its balance-sheet plans, particularly if it believes that the balance sheet policy is a culprit for market stress." Stated simply, for the Fed to be ready to announce a pause, or end, to Quantitative Tightening, stocks have to tumble once again, just so they can then be then rescued again by the Fed during the next sharp market drop.